UK pig meat production totalled 71,900 tonnes in December, which is a slight increase (+1%) compared to a year earlier. This brings production for 2018 to 926,700 tonnes, 24,100 tonnes higher (+3%) than in 2017. This is a result of higher slaughterings for both clean pigs and sows and boars. 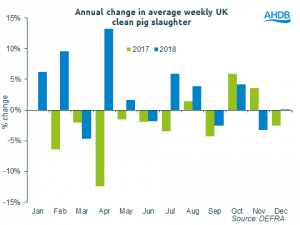 Tom Forshaw, an analyst at AHDB, said that clean pig slaughterings in December were similar to the previous year overall, at 834,800 head. He said: “However, in England and Wales throughputs were down by around 10,500 head (-2%) compared to a year earlier. 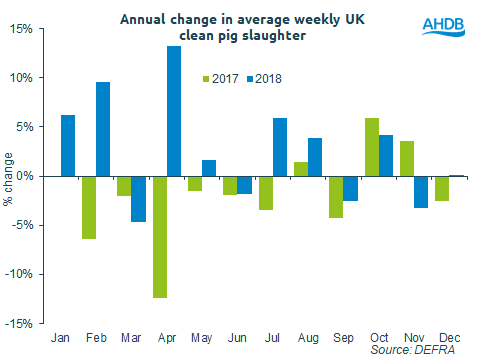 This was counteracted by an increase in slaughterings in Northern Ireland, up 11,700 head (+9%) in December, although slaughterings in Scotland were down by 500 head (-2%). Mr Forshaw said that carcase weights dropped slightly in December compared to the previous month, however, weights were nonetheless above the 2017 level for the first time since August. He said: “Averaging 83.2kg in December, the measure was 630g higher than the previous year. This is most likely indicative of fewer pigs being pulled forward as a result of poor demand over the December period.